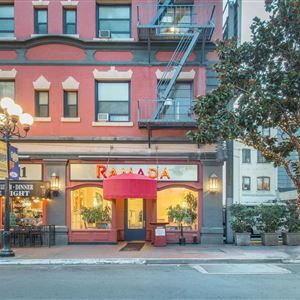 Property Location A stay at Ramada Gaslamp Convention Center-The Historic St James Hotel places you in the heart of San Diego, walking distance from Lyceum Theatre and Sculpture Garden. This eco-friendly hotel is close to San Diego Convention Center and Balboa Park. Rooms Make yourself at home in one of the 98 air-conditioned rooms featuring LCD televisions. Cable programming and video-game consoles are provided for your entertainment, while complimentary wireless Internet access keeps you connected. Private bathrooms with shower/tub combinations feature complimentary toiletries and hair dryers. Conveniences include laptop-compatible safes and desks, as well as phones with free local calls. Amenities Enjoy recreation amenities such as a fitness center or take in the view from a rooftop terrace. Additional features at this hotel include complimentary wireless Internet access, concierge services, and complimentary use of a nearby fitness facility. Dining Enjoy a meal at a restaurant, or stay in and take advantage of the hotel's 24-hour room service. Quench your thirst with your favorite drink at a bar/lounge. Business, Other Amenities Featured amenities include a business center, express check-in, and complimentary newspapers in the lobby. Planning an event in San Diego? This hotel has facilities measuring 2000 square feet (186 square meters), including meeting rooms. A roundtrip airport shuttle is complimentary (available 24 hours). 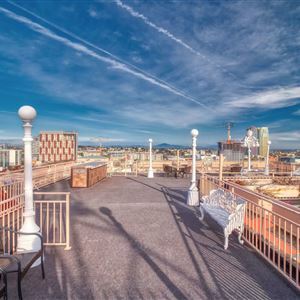 A stay at Ramada Gaslamp Convention Center-The Historic St James Hotel places you in the heart of San Diego, walking distance from Lyceum Theatre and Sculpture Garden. This eco-friendly hotel is close to San Diego Convention Center and Balboa Park. Make yourself at home in one of the 98 air-conditioned rooms featuring LCD televisions. Cable programming and video-game consoles are provided for your entertainment, while complimentary wireless Internet access keeps you connected. Private bathrooms with shower/tub combinations feature complimentary toiletries and hair dryers. Conveniences include laptop-compatible safes and desks, as well as phones with free local calls. Enjoy recreation amenities such as a fitness center or take in the view from a rooftop terrace. Additional features at this hotel include complimentary wireless Internet access, concierge services, and complimentary use of a nearby fitness facility. Featured amenities include a business center, express check-in, and complimentary newspapers in the lobby. Planning an event in San Diego? This hotel has facilities measuring 2000 square feet (186 square meters), including meeting rooms. A roundtrip airport shuttle is complimentary (available 24 hours).